“Bold Brands Win” is a mantra we have held “near and dear” at Madison+Main for a number of years, and over the past few months I’ve tried to share that with entrepreneurs, MBA candidates and anyone who will listen. I’m trying to “spread the brand gospel,” so to speak, and have had tons of speaking engagements recently. It was a big, bold, beautiful week at Madison+Main as we were able to spread that message all over the Commonwealth of Virginia with a little bit of “Gorilla” and “Guerilla” marketing. I am phoning in the Weekly Report this week, literally, as I am headed back towards Richmond from a highly productive 48 hours in Charlottesville. Monday (3/31) – On Monday, Sarah, Sammy, Colleen, Lindsey and I showed up two hours early at Madison+Main to play a fun prank on our colleagues, friends and neighbors in anticipation of April Fools’ Day. We fueled our banana content marketing campaign with this video, entitled, “Madison+Main Loves April Fools’ Day a ‘Bunch!’” It was “Gorilla Marketing” at its finest. In the afternoon, Sarah and I worked on new website copy. The bigger, better, bolderMadison+Main website will launch next month. #StayTunedAlso on Monday, we were excited to sign a contract with Link Masters, our first bit of direct proof that the banana campaign is reaching the right people: business owners. We’re very excited about working with the team at Link Masters as they roll out a revolutionary new product at next month’s National Hardware Show. 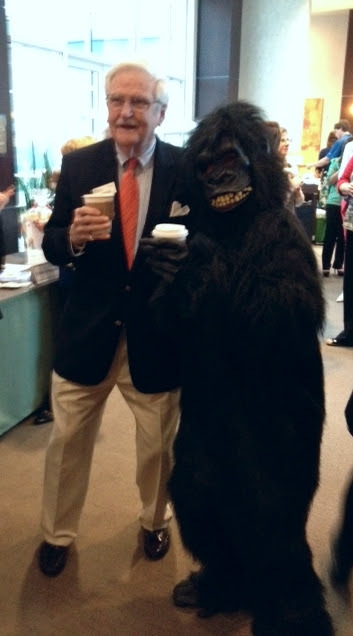 Tuesday (4/1) – On April Fools’ Day, several fellow Rotarians tried to prank me at breakfast, but I didn’t have enough coffee in me to understand what was going on. However, we did have a great presentation from Kingdom Life Ministries, who are working with men in the Richmond City Jail to make sure they don’t go back to jail. After a busy day, we got to hangout with our marketing partners Todd “Parney” Parnell and Mike “Murph” Murphy to learn more about the Flying Squirrels’ sponsorship opportunities one week before Opening Day at the Diamond. 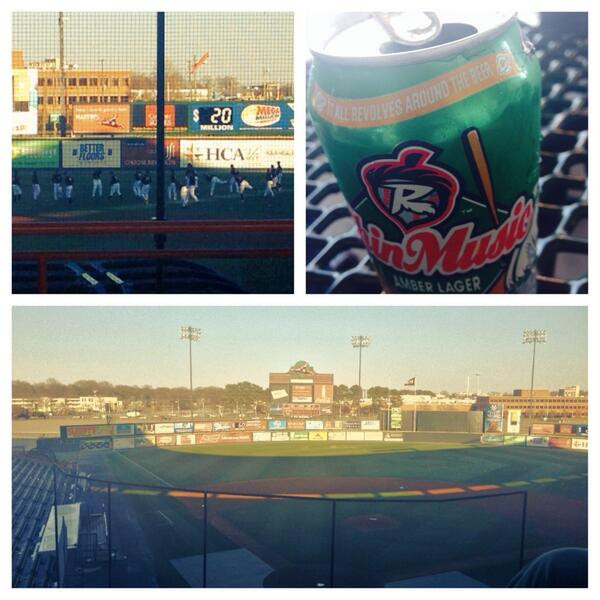 The Squirrels are one of the best entertainment experiences in RVA–if you haven’t been to a Flying Squirrels game yet, my advice to you is Have Funn, Go Nutz! Wednesday (4/2) – On Wednesday morning I worked with the Account team to write and review marketing activity reports for many of our clients. I’m thankful to my friend Tom Earlof Cloud Solution Group for introducing me to Dan Woods, President of Collegiate Marketing Concepts. Dan has a great company and we enjoyed a good meal at the Grill at Waterford. Whenever possible, I try to eat at locally owned restaurants. And why not? They’re better, the food is fresher and when I spend money with them the majority of it stays here in the community. On Wednesday night we traveled to the Center of the Universe. No really, we went to Ashland and the Center of the Universe Brewing Co., where we met with the brewmaster brothers Chris and Phil Ray and put together ingredients for Madison+Main’s Bold Brand Beer, which will be unveiled at the RVA Creativity Awards on May 1st. 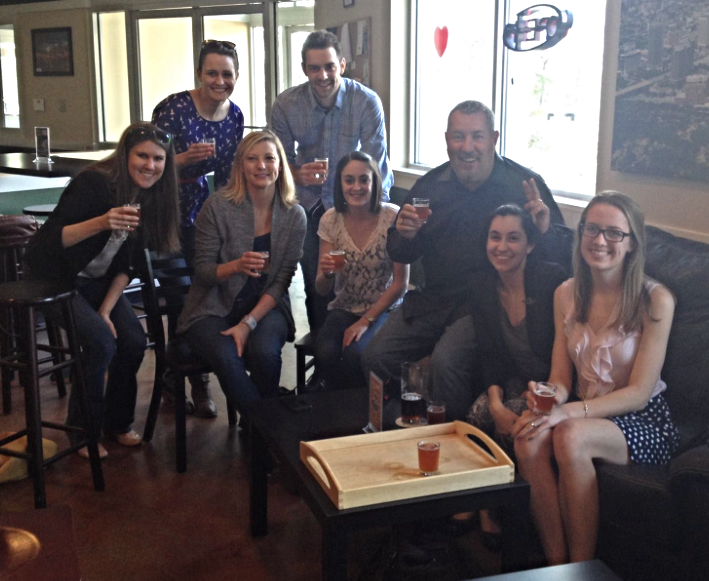 What do a bunch of marketing and PR people know about beer? As it turns out, a lot more than you might think. We can’t wait to share our brew with you soon. While I was surrounding myself with some of the best and brightest business minds in Virginia, the guys and gals back at the office were hard at work on several new broadcast, web and “Guerilla” marketing campaigns that will be launching in the next few weeks. One of the best lessons I’ve learned so far at this conference is not to play poker with other CEOs. I lost $40 and a small piece of my pride, but the damage could have been far, far greater. I want to personally thank Joanne Rossi of Zooom Printing for taking it easy on me. Friday (4/4) – This morning after only a few hours of sleep, I was back and engaged at the conference, which is hard to do when you stay up too late drinking Maker’s Mark and playing poker. 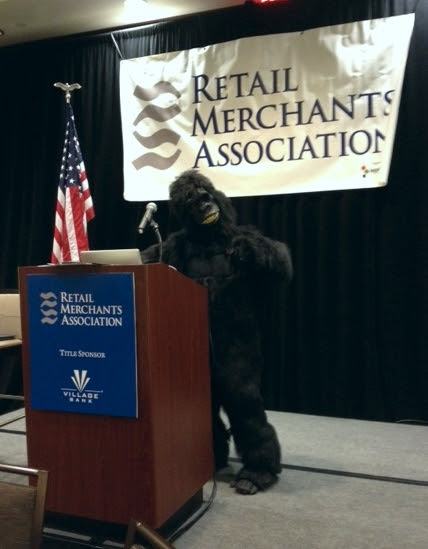 Meanwhile, at the Retail Merchant Association’s First Friday Forum, Sarah, Lindsey and Kelley did some “Guerilla” marketing with a gorilla. 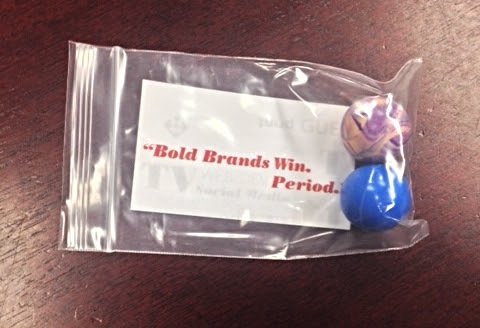 As the RMA Brochure Sponsor, we decided to give attendees bananas with a sticker that reads #BoldBrandsWin. This morning in C-Ville I did an Ignite Presentation (an Ignite Presentation, incase you didn’t know, is a 5 minute talk about a personal passion, with 20 slides that move every 15 seconds whether you’re ready or not). I tried to spread a little Brand Evangelism among the Council of CEOs; don’t worry, I taped all of the Ignite presentations and will share them on our YouTube channel next week. I think I did a good job because a dozen people (out of a hundred or so) walked up and told me so. 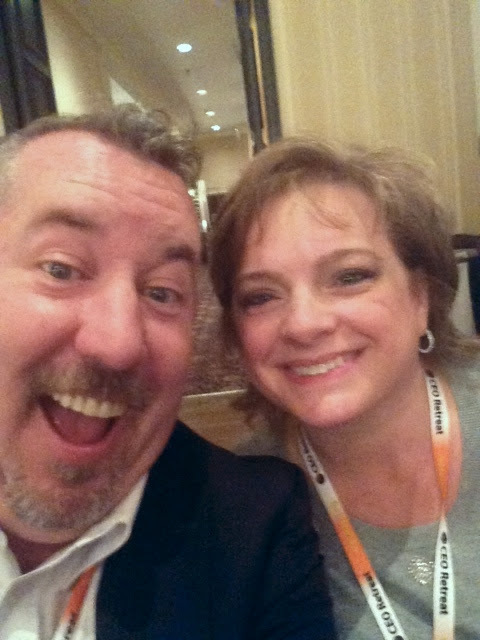 This afternoon at the conference I ran into an old friend, Michael Barnett, President and CEO of Romp n’ Roll. I told him what a big fan our VP of Brand Strategy Kara Forbis is; she takes her daughter Sutton there frequently. If you have little ones, visit Rompnroll.com– they have locations all over, not just in Blacksburg. We think handing out your business card with a pair of balls is bold. I wanted to personally thank a lot of folks for their positive feedback on the Weekly Report. I had a lot of praise for it at the VA CEO Retreat. If you know someone who would like to receive this email each Friday, or get some free marketing advice, check out my blog at madmain.com.